Who is Eebee? He's a cute and colorful character who entertains and educates babies and children through books, toys, and DVDs. Brandon likes the bright, colorful pictures and it keeps him interested. He learned pretty quick and already started to tell me the stories through pictures and what he sees in the pictures. I think the books help him expand his imagination and this is really great. I hope to purchase the DVD collection for Brandon this Christmas. I'm sure he'll enjoy them. Eebee's Adventures All About Me and You! : Head-to-Toe Adventures for Your Baby. Start Anywhere. Go Anywhere! It’s a book…and a game, too! All About Me and You is an adventure all about eebee’s—and every baby’s—body. 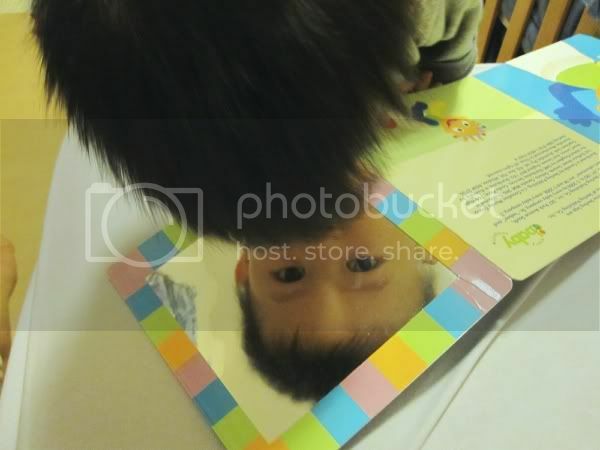 Each page features a specially designed interactive board game: just unfold the book-sized mirror and baby can “look and play” along with eebee, making funny faces, throwing kisses, waving and clapping, and wriggling fingers. For extra fun, grown-ups can come up with their own ideas, too, based on their child’s interests and personality. Best of all, these entertaining activities exercise baby’s social, motor, language, and thinking skills! 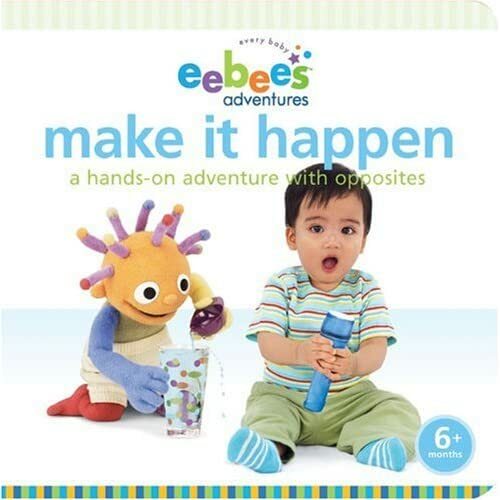 In this hands-on adventure, eebee and playmates celebrate the fact that every baby learns through play and interaction. On each page, curious toddlers join eebee to Make It Happen by exploring big ideas and concepts, including up and down through a game of baby bowling; one, more, and many by playfully ripping a piece of paper to create bright confetti; on and off with a flashlight; wet and dry with a rubber duckie and a towel; and open and closed with this very book. Eebee's Adventure Books can be purchased from listed retail bookstores. You can also purchase the books and toys from eebee.com or on Amazon.com. One (1) lucky reader will have a chance to win a choice of one of the two books mentioned in the review. Chosen winner will be selected via Random.org. Winner will have 48 hours to respond to claim their prize. 1) Simply tell me in the comment below which one of the two books mentioned above that you would like to win. Contest is open to US and Canadian residents. Contest closes December 2, 2010 11:59pm (PST). Disclosure: I received a copy of the mentioned Eebee Books from Sterling Publishing at no charge in exchange for a review of my opinion. The opinions expressed are my own personal and honest thoughts. No other compensation was given. I like the book Make it Happen. the All About Me And You is great! I'd like "Make it Happen" for my friends' little one. I would like the all about me book. I would pick the All About Me book for my little grandson. I'd love to win All About Me and You! It sounds like a great first book for a baby. I follow The Art of Jennie Yuen blog! All About Me and You! I would like to win the Eebee's Adventures All About Me and You! I LIKE THE Eebee's Adventures All About Me and You! : Head-to-Toe Adventures for Your Baby. Start Anywhere. Go Anywhere! Eebee's Adventures Make It Happen: A Hands-on Adventure with Opposites.